This production contains stroboscopic lighting effects. 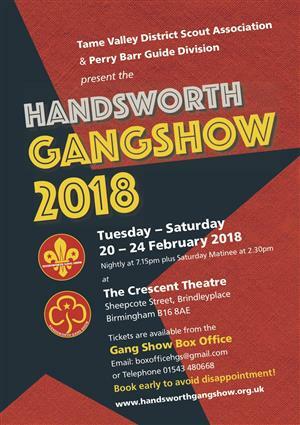 Tame Valley Scout District joins with Perry Barr Guide Division to bring to you another of their extremely popular, Gang Shows. With music and dance chosen from the twenties right up until the present day, the Gang Show showcases great singing and acting performed with energy and enthusiasm by the 100-strong cast. This year’s show has definitely moved with the times and yet still remains firmly in the Gang Show spirit. Each Gang Show is a wonderful opportunity to showcase Scouting and Guiding giving an opportunity for new stars and “old faces” to work together in the spirit of team work, fun and friendship that epitomises these two movements. Book early to avoid disappointment! If you enjoyed this production please let us know by completing a Feedback Form. The Crescent receives no external funding so we rely very much on donations of money or time to help meet the cost of running a city-centre theatre.